(Newser) – You're probably less likely to see an Amish kid carrying around an inhaler, because they don't seem to get asthma as often as other kids—and researchers think it's due to the cows, Live Science reports. 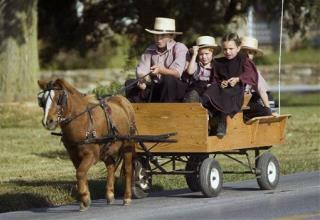 In a study published in the New England Journal of Medicine, University of Chicago genetics professor Carole Ober and her team wanted to see why kids raised Amish-style seem to benefit from extra immunity against the disease. They selected blood samples from 30 kids ages 7 to 14 from an Indiana Amish community, as well as from 30 kids of the same ages from a South Dakota Hutterite community—a group similar to the Amish in terms of their genetic history, cultural values, and lifestyle, including a belief in big families, breastfeeding, and the shunning of modern electronic conveniences; even their diets are similar. The scientists also collected dust from 10 homes in each community. It's basic hygiene. The Amish wash their bedding routinely. It is important to wash pillow cases and pillows very often in hot water. Then they hang them outside where fresh air and UV from the sun does the rest. Also, this is the main reason for their clear skin and few pimples. The truth is they have to eat sawdust twice a week. Really helps the lungs in good doses! This article did not surprise me at all and I agree with, e.g. Prgrmr's post. I'm pushing 73 years old. When I learned in grade school that vaccinations "give" you the disease so your immune system learns how to fight it, I decided to largely eschew any concern about exposing myself to germs, bacteria, whatever. The last time I remember getting really sick was some 12 years ago when I had a bout with some kind of flu. It lasted all of about 2 days. All I did for it was to take some Echinacea. I have always refused to get get flu shots. I did contract Lyme disease in 2007. On a Saturday night I could barely lift a 5 pound weight. I went to the hospital Sunday morning and let them give me an antibiotic shot but only after asking if there was any other remedy. By Tuesday morning I felt great and was again lifting heavy loads (over 1/2 my body weight) as I was in the process of moving. I have had no subsequent short or long term effects. I also skipped the last week of the 3-week antibiotic pill regimen. This year alone I've had half a dozen tick bites. I'm pretty sure from the skin reactions that several had the Lyme bacteria, but I've not had any ill effects. Research suggests one can indeed develop immunity with multiple exposures. I think my, what I believe to be, robust immune system was well up to the task Basically I just don't get sick these days. I don't even have days when I feel "off." I also don't have any allergies that I know of. "Playing in the dirt" has been a lifestyle to teach my immune system since grade school. I firmly believe that has been a primary source of my (so far) continued good health. Lord knows I have been and am exposed to all kinds of stuff that might otherwise have made me sick.